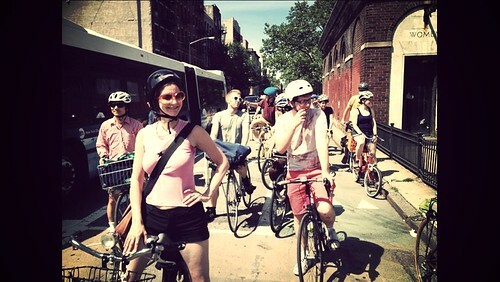 Keegan Stephan has being doing amazing things for cyclists in NYC. 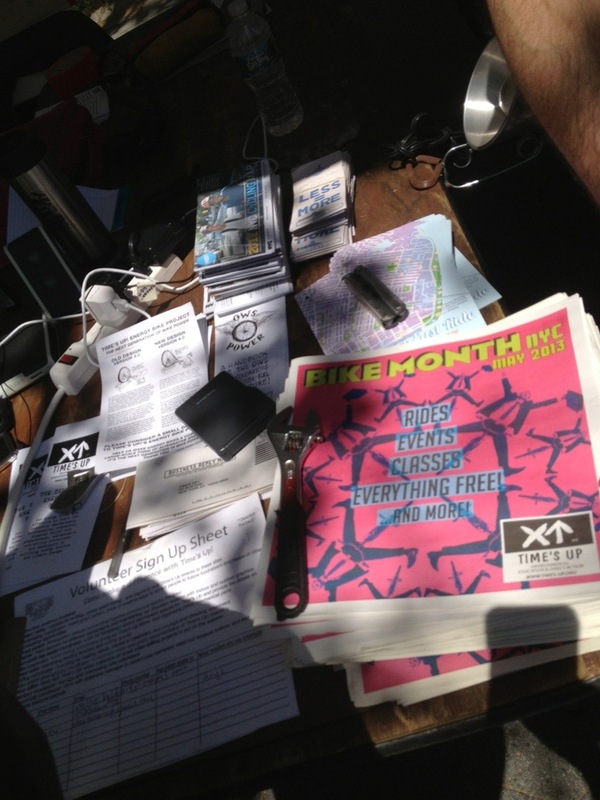 Occupy Wall Street, providing bike generated electrical power and relief with Occupy Sandy, Volunteer Mechanic with Times Up, deliveries on Cargo bikes, hosting bicycle radio programs, organizing rides and garden clean ups…just to name a few activities. August is right around the corner and that means lots more summer…summer streets that is. Once again the city will be closing 7 miles of streets to motor vehicles and open to pedestrians, bikes and other non-polluting transportation, the first three Saturdays of August. (8/3, 8/10, 8/17) Time’s Up will be there to ride the route as a group. More information, below in the events listings. It’s a little late, but we still love this great feel good story where Time’s Up volunteers came to the rescue of cyclists in need. Back in June, a blind Harlem man and his wife had their beloved tandem stolen and Time’s Up came to their aid by raising money for a new ride. Come join us for the rides, events and workshops listed below. Details follow the headlines. Brooklyn Space-99 South 6th St.
ABC NO RIO-156 Rivington St.
Time’s Up Brooklyn Space-99 South 6th St.
See events listing for details. Meets the 1st Friday of every month at the Columbus Circle entrance to Central Park. Enjoy the tranquility of the park and its beautiful ponds and waterways. A nature lover’s dream. Meets the 1st Friday of every month at Union Square N.
A fun, leisurely ride, creating safe and sane streets. Route to be determined by participants. Meets the 2nd Saturday of every month at the Grand Army Plaza Entrance to Prospect Park, Brooklyn. Discover Prospect Park at night with a peaceful ride that visits many of the park’s little-known treasures. Meets the 2nd Friday of every month at the Grand Army Plaza entrance to Prospect Park. A monthly celebration of bicycles. Bring lights & bells. Meets the 3rd Sunday of every month at the Gandhi Statue in SW Corner of Union Square Park. A leisurely peaceful ride to some of downtown Manhattan’s peace sites. www.peacemuseumnewyork.org. 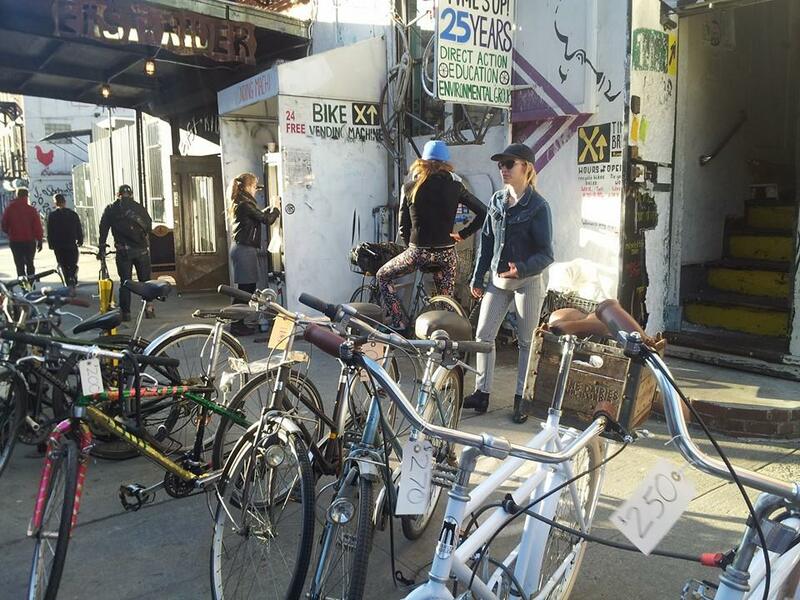 The bike ride that changed NYC. Meets the last Friday of every month at Union Square N.
celebrate nonpolluting transportation and exercise our right to the road. Bring lights and bells. Meets the last Saturday of every month at the Columbus Circle Entrance to Central Park. A magical, evening ride enjoying the tranquility of Central Park & the grand vistas of the Hudson River from Riverside Park. Happy Earth Day everyone. The hippies started this thing back in April 22nd, 1970. I mean someone had to clean up all that trash from Woodstock. Time’s Up is getting busy for April, cleaning up community gardens and cleaning up the Earth. Photo from Time’s Up Flickr. In both NYC and Brooklyn locations! SUBSCRIBE TO OUR FEED ON FACEBOOK!